Here's the story of what happened on Day One of the currency futures. 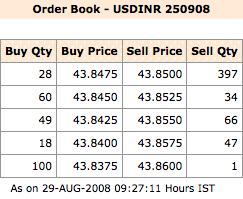 Majority of USD-INR trades take place when the US markets are open(i.e. Indian mkts are closed). Interestingly, to chart tommorrow's infosys stock you simply need to look at today night's infy US ADR closing trend. I believe a similar phenomenon will occur here, with investors being able to predict tommorrow morning openeing FX rates by looking at tonite's rates on bloomberg.